Mr.Layland offered to plan our Friday evening last week! He told me we would most likely be staying at home and having a low-key date. After a long week I was totally fine with that. However, when I got home he was waiting for me on the couch and he asked if I was ready to go. Dessert first = best date I’ve ever heard of in my life. Our date began with a Tres Leches cake and the perfect amount of delicious frosting! After we ate half the cake we headed out for a night of sales shopping. Mr.Layland scored a pair of jeans for under $10 and a sweatshirt for under $10 and I spent over $100 on new makeup. For those ladies who are curious, I went with the new liquid foundation by Bare Minerals and I love it! I also invested in a few brushes and their translucent setting powder. It’s really fantastic, check it out! When I finished my makeover we headed to California Pizza Kitchen for dinner. It was the perfect timing because I was hungry once we got done at the mall and then I realized we still had to eat dinner! Awesome! It was 9 o’clock and as you can imagine it’s not a super busy time for a pizza place so we were a little under-served. Mr. Layland drinks water faster than any waiter can keep up with and that night was no exception. Instead of coming by every 5 minutes to check on us we waited about 10 minutes before someone came by with water again. I know, I know #firstworldproblems but the pizza was as delicious as ever! Raise your hand if you like movies! I love movies but lately I’ve turned into a 95-year-old woman and fall asleep around 9:30 if we’re watching something. Frankly, it’s embarrassing. I designed this date to be more than a night where you just watch a movie together and call it a day. I checked out To Kill A Mockingbird from the library (check your library for a DVD section!) because Mr. Layland had never seen it. I know, I know. Not sure how he’s made it this far in life without it but I think I got to him in time. Since the movie is told from the perspective of Scout, the 6 year-old girl, I decided to gather up some childhood themed treats for us to enjoy while we watched it. When I bought those Kool-Aid Burst drinks I automatically felt like I should be sitting at the popular table in 5th grade 🙂 I wonder if they’re still cool. They’re only $1 for six so if they are still cool, popularity is much cheaper now. I was crazy about Muddy Buddies as a kid and luckily we had some on hand! Same with the pudding cups. I seriously scored with my timing. I had everything I needed! As for the smoothies, when I was a kid I was convinced that if I wanted a treat all I had to do was make enough to share with my parents and they would be so thrilled with my offering that I could then eat the rest. I have to say my smoothie making skills have come a LONG way since I was 10 so these were actually really delicious! I wish I could say I managed to stay awake for the whole movie but alas, I still fell asleep. In my defense I did make it past 9:30! You know when you’re in that thing called love? But you’re also really busy with that thing called life? How do you share your love with that special someone when both of you are so busy and just fitting in a date is difficult? For the past few months Mr. Layland has had almost the opposite work schedule from me so our time together is mostly on the weekends. This romantic DIY project has helped us to stay close even when we don’t see each other as much as we would like. UPDATE: I recently switched out the paper to coordinate with our new bedroom. I got the paper at JoAnn’s and absolutely love the little hearts! 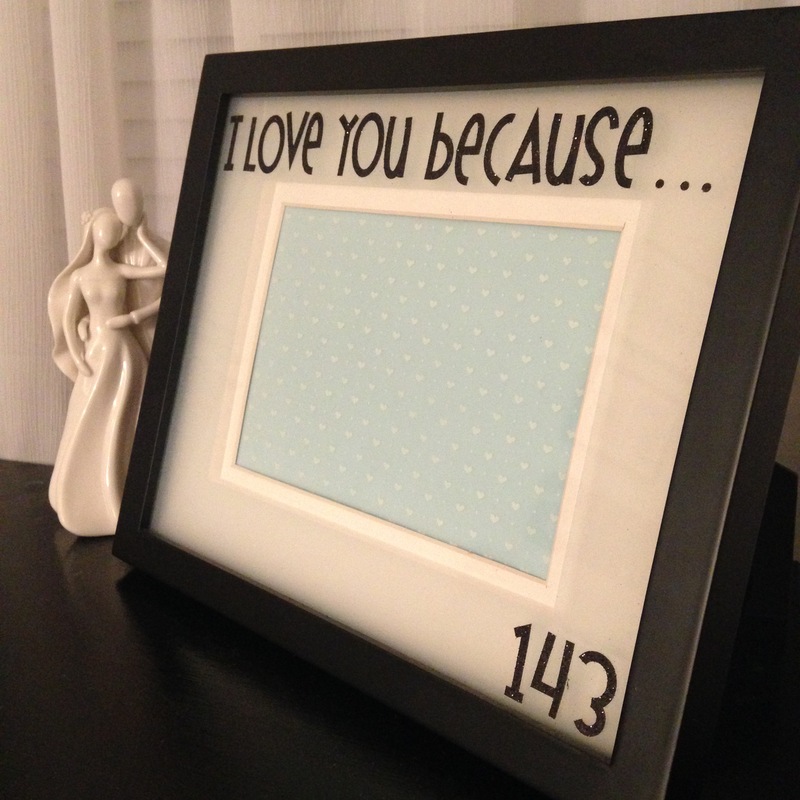 The first time I saw this in action it said, “I love you because…you did the dishes!” My cousin Travis and his wife Lexi are one of the cutest and happiest couples I know and it was their I Love You Because frame that I saw first. I loved that idea so much that I made one for Mr. Layland last Christmas! Sometimes the things Mr. Layland writes on our frame are so sweet it completely makes my day. Take the mat out of the frame and use the outside edges to trace a rectangle on the back of the scrapbook paper. Cut the paper along the lines. Insert the mat and paper back into the frame. Spell out “I Love You Because…” along the top and you’re set to start writing cute little notes! You can also add your anniversary date at the bottom. 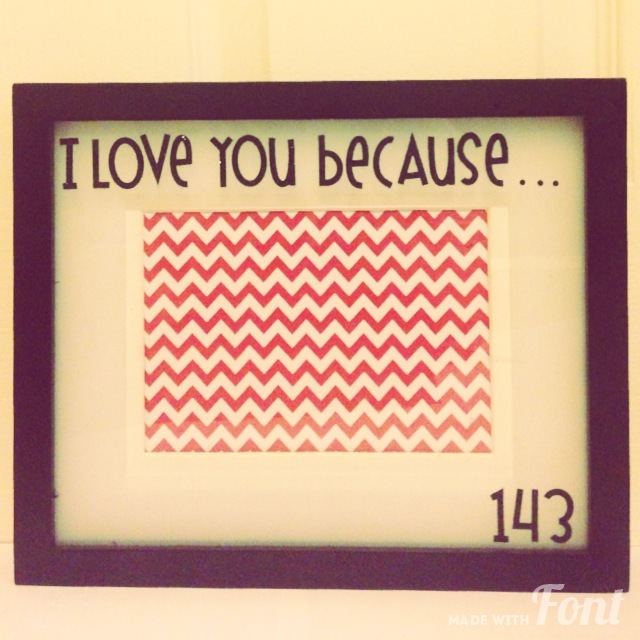 The 143 in mine means “I love you”. This frame is one of my favorite things we have. It’s not only cute & people think it’s really sweet when they come over but it makes it easy to compliment each other! It’s allowed both of us to express our feelings and helped us to know that the little things we do don’t go unnoticed. It takes thirty seconds to write a message and you never know, those words can change your loved ones’ day! Some nights Mr. Layland gets home late from work and I’m officially 90 years-old so I can only stay awake until about 11 o’clock. So what do you do on those nights when you only have thirty minutes together before one of you (me) starts talking nonsense? It’s the 8-Question Date! You can make it ahead of time (I made mine when I had some down time at work) and have it ready for those short evenings together! You make a fortune teller or a cootie catcher or whatever you used to call it in Elementary School and customize it for a get-to-know-you date. What’s a new hobby you’d like to try? Name for top 5 past times. How did you feel loved this week? I love this game because if you don’t have time for anything else, at least the two of you will get about 20 minutes of really good talking time! I heard a commercial on the radio for the Wet ‘n Wild water park last weekend and thought, “Wow, that sounds like so much fun!” Not to mention it’s consistently been 106 for the past two weeks. Seriously. Apparently this week I was really into surprise dates. I’m the worst at keeping my own secret date ideas to myself because I get so excited about them but THIS one, I was determined not to tell until that day. So I kept it all to myself until I sent Mr. Layland these really obvious clues. He guessed it right on his first try. HINT #1 – You will need your swimsuit tonight. HINT #2 – At some point we might feel a little LAZY. HINT #3 – Things might get WILD! When we spotted the water park from the road I got really excited. I know it was my surprise for Mr. Layland but I honestly think I was more excited. I tend to get a little enthusiastic about new things and heck – it’s a water park! Who doesn’t love that? We got there and I felt like it was my first time at Disney World. We stashed our stuff in a locker, snapped a quick pic and we were off! I won’t go into detail of each ride we went on but I’ll describe my top three. The Constrictor is a super windy tube slide. It’s dark the whole time and has a few surprising short drops. It was thrilling and we screamed like little girls. Mammoth Falls was borderline terrifying. We got to cut the line because a mother and son needed another set of two so we only waited for about 20 minutes. The first 10 seconds is a twisted tube slide but then it DROPS. We’re talking Splash Mountain kind of drop…except I was backwards. Backwards! Right before we slipped over the edge I looked over at Mr. Layland and screamed at the top of my lungs. The drop swoops up a wall and you slide down into a shallow pool. All I have to say is, watching the ride in no way prepares you for it! The third best was another two-person funnel ride, Maximum Velocity. I was surprised at how fast we went, it was just like a roller coaster! It’s a two person ride which was fun because we got to scream as much as we wanted and not bother other riders. We decided that all the rides are faster and more exciting at night 🙂 It was the most exciting four hours you could have asked for and worth every penny!